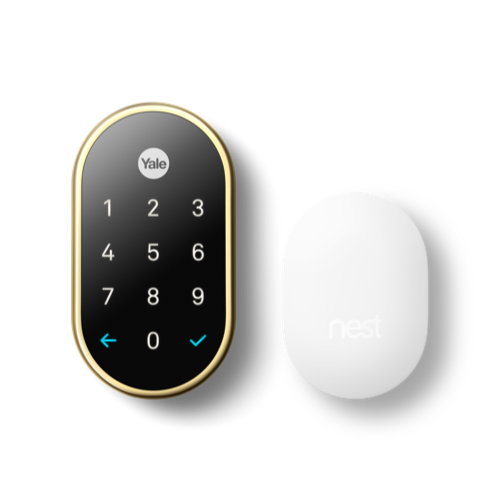 The Yale Nest x smart deadbolt lock lets you remotely lock and unlock the door, check if you locked the door, and get alerts when someone locks or unlocks it. The Nest x is used with the free Nest smartphone apps. It works with your home's WiFi network, without no automation hub required. With Yale’s expertise in manufacturing secure locks and Nest’s vast knowledge of connecting your home, you can rest assured your home will be safe from unwanted intruders. The Nest x is key free so it can't be picked or bumped like traditional keyed locks. 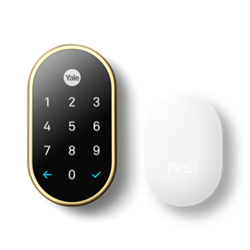 The Yale Nest x gives you the ability to assign up to 20 user codes for family, friends or workers. You'll be alerted when someone locks or unlocks the door. You can also have the lock automatically lock itself whenever you leave so you don’t have to worry about leaving the door unlocked. Note: Doe NOT currently work with Amazon Alexa. Internet & WiFi required.